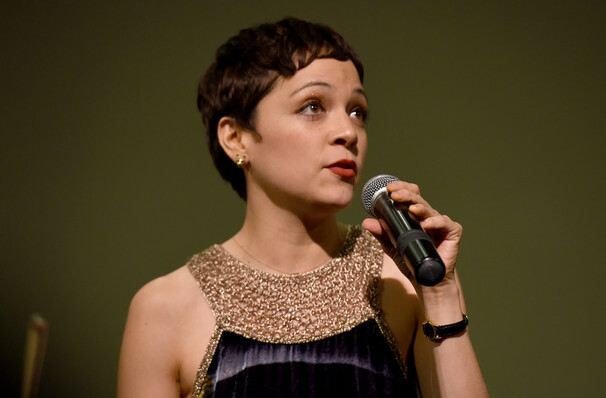 Maria Natalia Lafourcade Silva represents the new generation of Mexican musicians, fusing the traditional sounds of Latin Pop and bossanova with modern pop arrangements and recordings. Her lyrical soprano voice and introspective, poetic lyrics have earned the songstress an astounding 10 Latin Grammy Awards to date, marking her as one of modern Latin music's most successful singer songwriters. Ahead of the 2018 release of her 8th studio album Musas Vol. 2, Lafourcade is hitting the road, bringing her latest blend of the traditional and the modern to stages across US shores. The enchanting performer weaves a spell-binding live show with a soft and deeply expressive voice that calls to mind the timeless love songs of her musical predecessors. Sound good to you? 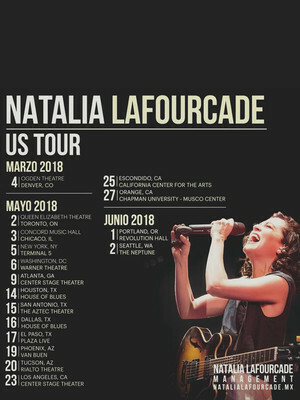 Share this page on social media and let your friends know about Natalia Lafourcade at Center Stage Theater. Please note: The term Center Stage Theater and/or Natalia Lafourcade as well as all associated graphics, logos, and/or other trademarks, tradenames or copyrights are the property of the Center Stage Theater and/or Natalia Lafourcade and are used herein for factual descriptive purposes only. We are in no way associated with or authorized by the Center Stage Theater and/or Natalia Lafourcade and neither that entity nor any of its affiliates have licensed or endorsed us to sell tickets, goods and or services in conjunction with their events.